New York (Tadias) – She may not be the first Ethiopian woman pilot, but Captain Amsale Gualu Endegnanew is just as pioneering. She is the first female to become captain in the history of Ethiopian Airlines. According to the company, the pilot was at controls of a next generation Bombardier airplane for her historic flight, which she performed over domestic routes on October 14, 2010. 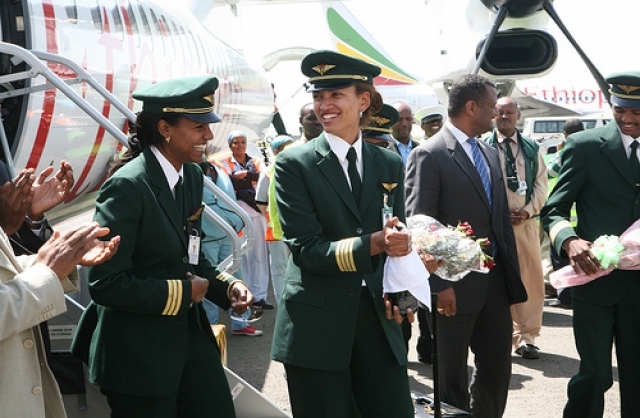 “Captain Amsale proudly took off her first flight from the left hand seat of the flight deck of a Q-400 aircraft from Addis Ababa to Gondar then to Axum and finally returned back to Addis Ababa after a total of 3.6 flight hours,” the airline announced in a press release. “The company has been very supportive of my efforts to realize my vision of becoming a captain,” she added. Congratulating her on the occasion, Weyzero Elizabeth Getachew, a Senior Vice President for Human Resource Management and the highest ranking female executive in the airline said, “Captain Amsale’s success is a great achievement on her part and it is also an achievement for the airline. 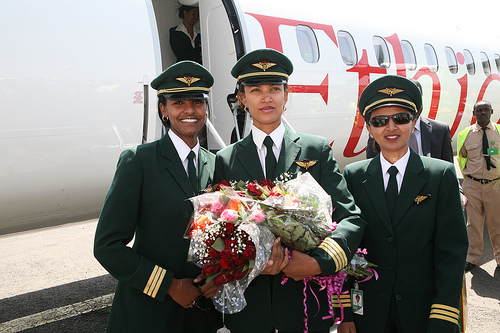 It is my hope that other females will be inspired by her success and Ethiopian will see more female candidates in the near future.” The country’s flag-career currently has four female pilots working as first officers. Who is Ethiopia’s first female pilot? Some say Weyzero Asegedech Asefa, who became a pilot post World War II, is the first Ethiopian female pilot. While others argue that Weyzero Mulumebet Emeru, whose flight training was interrupted when the Italians envaded Ethiopia in 1936, holds the title of first Ethiopian female pilot. Learn more about Ethiopian airlines at ethiopianairlines.com. My heart felt congratulations to Capt Amsale on her historic accomplishment. This is not only a major milestone for our airline, but an inspiration to women in general. As you know, Ethiopian Airlines Pilot Training School attracts students from all over Africa and it is my hope that this news will encourage other women from around the continent to follow suit. Hi captain Amsale, Congratulation on your Success! You are a role model for women. Congratulations! Capt. Amsale. I take my hat off for you. I am proud of Ethiopian Airlines. When I think of my country, EAL comes to my mind. What happened to Ato Girma Wake, the general manager of the airline? Where is he? He was so intelligent and managed EAl successfully. It is so sad to see some one like him replaced by less qualified personnel. Congra!! We are proud of you! Wow, it took her 10 yrs to become Captain? That is some serious training. One can become a medical doctor, an engineer, a lawyer, even a professor in 10 yrs. But this is her chosen work, so Congratulations on your achievement. Great Amsale! 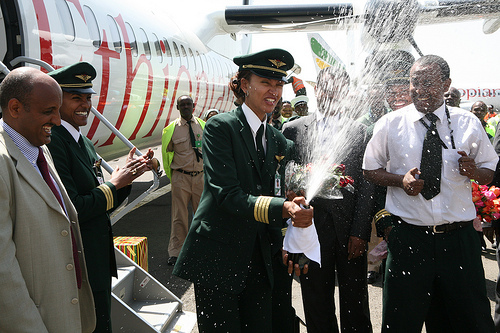 Congratulations on making your dream of becoming the captain of Ethiopian Airlines, Africa’s number one airline! Enjoy your profession and long life. Stay blessed. Well done. Congra sis! u r now an excellent exampel to all of us and an asset to our beloved Ethiopia. The story of Captain Amsale of Ethiopian Airlines is great addition to the history of women in Aviation. 1939 – Willa Brown, first African American commercial pilot and first African American woman officer in the Civil Air Patrol, helps form the National Airmen’s Association of America to help open up the U.S. Armed Forces to African American men. Such a beautiful role model to our girls, I’m absolutely proud of you! Does anyone know how many women pilots there are in Ethiopia? I hope her men colleagues are nice to her and treat her with respect because as a professional women, I feel that is very important for her future advancement within the corporation. Abehsa men can be very difficult to work with. They feel intimidated by a strong women. That’s my personal experience. Amsale, congratulations on your achievement thus far and all the best in your future endeavors. She is betam konjo too! Well done Captain Amsale. Keep it up! I can’t believe it took so long to name a female captain at Ethiopian airlines. You need to be upto date ET. Need more women in the ranks? One is not good enough. This is 2010, not 1830. What an inspiration and trailblazer! I hope more young girls will follow in her footsteps. Way to go Captain! What a beautiful role model. Good luck with everything. This is EAL the poineer for AFRICAN Aviation standards. Amsale we really are proud of you. WEL DONE!!! My Dear Capitain Amsale-You are the winner.wow! !,the stick is in your hand. I am very sympathetic to your concern.Forget in Ethiopia my dear!!! Men in the west went through the most atrocious Feminism and Sexual revolutionary Battles,never even got wounded.The Men myth saved them.How about Women trying the Chines Yin and Yang concept of complimentary whole,struggle through strength and tenderness that is the only solution left for women to defeat this myth.I think so.Thanks. Well done, this is an achievement. One question, What happened to Captain Sefanit? Wasn’t she also an Ethiopian Airlines Pilot? You made history. I admire your determination and persistance for 10 years. Joking aside though, you do have a point to a certain extent, but please do not exaggerate or generalize. Last, but not least, big congratulations to Amsale on her success!! Stay strong! Congrats captain you are a hero! Congratulation mokshae, well done I am really proud of you. You are such a brave and dedicated woman to your career. Best wishes and good luck. In the midst of the fog of difficulties and challenges Ethiopia is facing, this is indeed good news to celebrate. Capt. Amsale, her family and the EAL staff is to be commended for this success. We look forward to a new decade when the outstanding achievemnets of EAL will continue under the new leadership and the formidable team it will be able to inspire, lead and encourage. Cangratualtions to Capt. Amsale and God Bless Ethiopia!!! Congratulations and well done. Good luck in your work. Captain Amsale, koranibish ehitachin! Awesome achievement & all the best from here on dear! Wow, it’s really interesting and inspiring. She is indeed pioneering!!!!! What a pleasant and encouraging news. Well done Captain Amsale. You are such an asset for the entire Ethiopian Nation. Why did it take so long to hire a female pilot? Shame on Ethiopian airlines for dragging its feet for over 6 decades. It is about time! Keep it up, it is a great achievement and inspiration for all Ethiopians, especially for females! Cogratulation Capt-Amsale betam des yemel neger new. She is an Angel in the sky. Way to go Amsale! we are proud of your success;congratulation!! well on the contrary i envied u at first because u r living my dream!! !i am 20 years old,a mechanical engineering student and am working really hard so i could even have a shot at my dream,my dream being a very talented and devoted pilot!! !i still live for that dream and well though you became the first captain i still wish i could be the next one and even take it further!! !this is the only dream i have ever had and am still going to work super hard for it and u are the icing to the cake cause u r an inspiration!! !n i hope with God’s help i make it as far as u did n become an inspiration to others as u are for me!!!congrats!!! Wow! U r an inspiration! And i am rly inspired! I am a mechanical engineering student! I always wanted 2 b a pilot n i hope i will, ofcourse if god help me, am rly honored 2 say it 2 u, Tnx, Captain! Way 2 go captain!! I’m happy that i finally can say i’ve a role model.never had before.things will be great me and ma gifted sisters come up with such heroic movment in my mother land!! !stay blessed! !